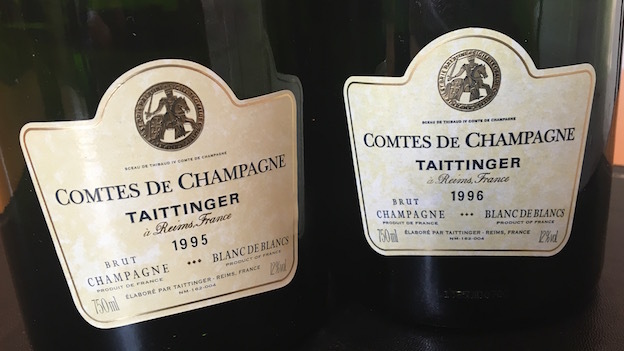 Taittinger’s Comtes de Champagne has long been a personal favorite. Among other things, Comtes ages spectacularly well, is relatively easy to find (despite its small production) and is very well priced for the quality relative to its peers. Because of its somewhat lower profile within the world of grande marque Champagne, Comtes remains the insiders’ wine among the region’s luxury tête de cuvées. In my view, Comtes is a core holding in any well-stocked cellar of fine Champagne. The 1996 Comtes de Champagne is utterly magnificent. The bouquet alone is enthralling. Brioche, baked apple, pear, vanilla and spice flesh out first. Wonderfully deep and seductive, the 1996 possesses superb depth to match its exquisite, layered personality. The 1996 finishes with a hint of reduction and that note of lemon confit that is such a signature of Comtes with some bottle age. Just entering the early plateau of its maturity, the 1996 will continue to delight those lucky enough to own it for another two decades or more. This is an especially vibrant bottle of the 1996, but it was also disgorged in 2012, a few years after the initial release. 98/Drinking Window: 2016-2036. Candied apricot, honey blossom, orange rind and tropical fruits are some of the many notes that emerge from the 1995 Comtes de Champagne. Although not as ripe on paper as the 1996, the 1995 is unmistakably exotic and flamboyant. Wonderfully expressive, open-knit and giving, the 1995 is a fabulous choice for drinking now, as it is close to fully mature. I don't expect the 1995 to be as long-lived as the most cellar worthy vintages, but it is positively stunning today. I’ve had slightly fresher bottles of the 1995, but in recent tastings, the it has always had a very specific extroverted character. 96/Drinking Window: 2016-2026.